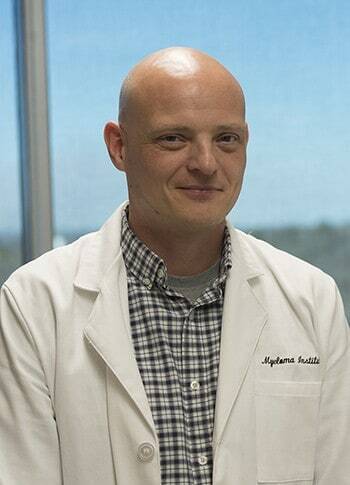 Feb. 29, 2016 | LITTLE ROCK – Brian Walker, Ph.D., has joined the University of Arkansas for Medical Sciences (UAMS) as a professor of medicine in the College of Medicine and director of the Myeloma Institute’s basic research team. Walker’s most recent post was as a senior research scientist with the Centre for Molecular Pathology at The Royal Marsden Hospital in London, a renowned myeloma research and treatment institution. Walker received his doctorate in Molecular Immunology from Imperial College, University of London in 1999. In 1992, he completed a bachelor’s degree in medical microbiology from the University of Edinburgh. Walker completed a fellowship in hematology/oncology in 2008 at The Institute of Cancer Research in London. Since 2004, his research has focused on the genetics of myeloma. 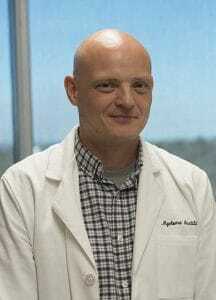 His research team is involved with investigating the genetics of myeloma using cutting-edge technologies to elucidate the mechanisms of disease initiation, progression and response to treatment. The UAMS Myeloma Institute is one of the largest centers in the world for research in and treatment of patients with myeloma and related diseases. Patients come to the UAMS Myeloma Institute from every state in the U.S. and more than 50 countries.